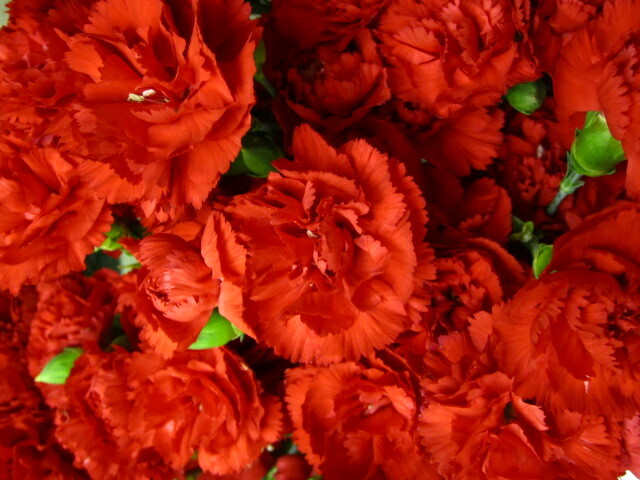 Lady: They’re from me and Dad! 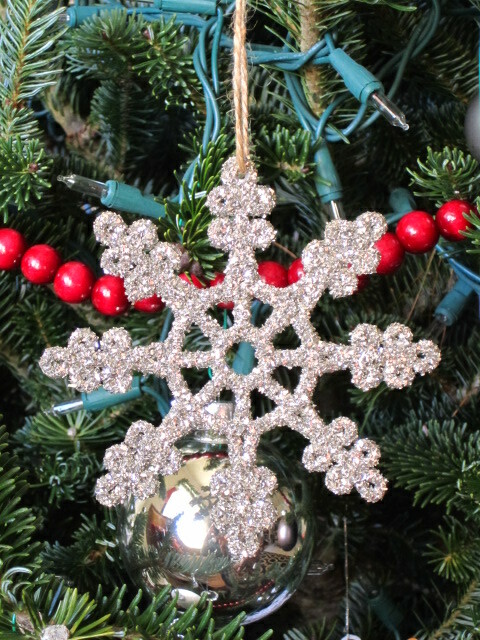 It was a Christmas present, but not a wait-until-Christmas present, so I opened the box and discovered a set of six sparkly snow-flake ornaments. 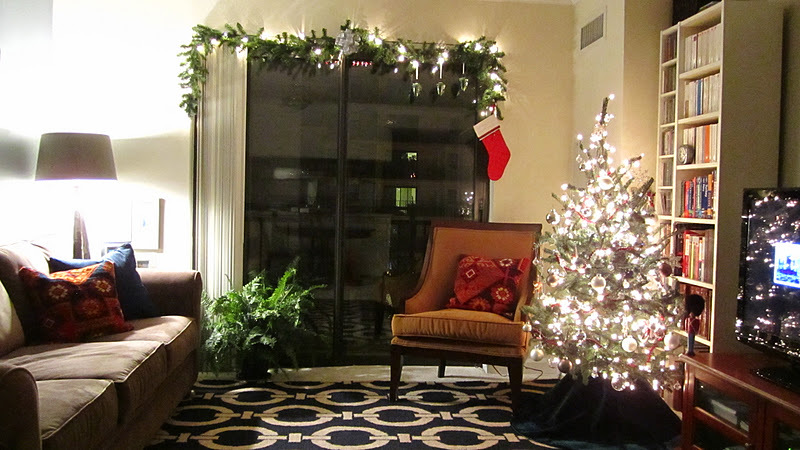 Which meant it was time to start decorating for Christmas! 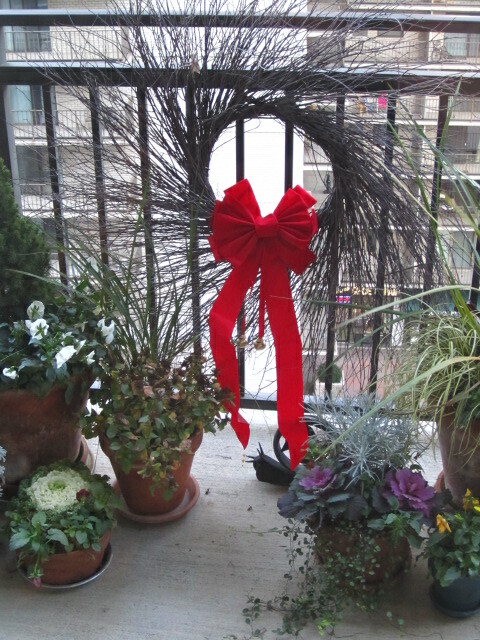 and then a red bow for the wreath outside. But the tree was a puzzle: How on earth was I going to fit an entire TREE into my living room without major disruption of the feng shui? It would have to be a small tree so that it could fit into the corner by the yellow chair. “Small” was a concept that the Boy Scouts down the street couldn’t quite grasp: “Here’s one — I think it’s only a six footer!” So I headed over to Home Depot where I found an entire section of trees between two and four feet tall. I inspected three and took the winner to the check-out stand. I knew I’d chosen well when it fit end-to-end in the trunk of my car. Once home, I called Lady and set up shop on the balcony for the light-stringing ritual. 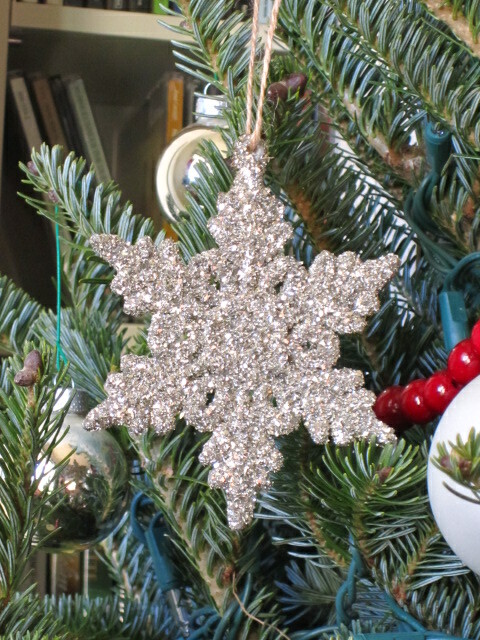 I took stock of my inventory of tiny white Christmas lights and sized up my tree: I had four 100-light strings and approximately four feet of tree. According to the article by interior decorator Colin Cowie in this month’s Elle Decor, that was the right ratio. But Mr. Cowie hadn’t been raised by Lady and is therefore used to trees that cannot be seen from space: “Eight strings,” she said, “you’re going to need eight strings.” She hadn’t even seen the tree. But, of course, she was right. By the time I’d used up the fourth string, I was only about two thirds of the way through the tree. With hypothermia setting in, I wasn’t too keen on running back to Home Depot for more lights, so I tried rejiggering the lower strings to make them go further. 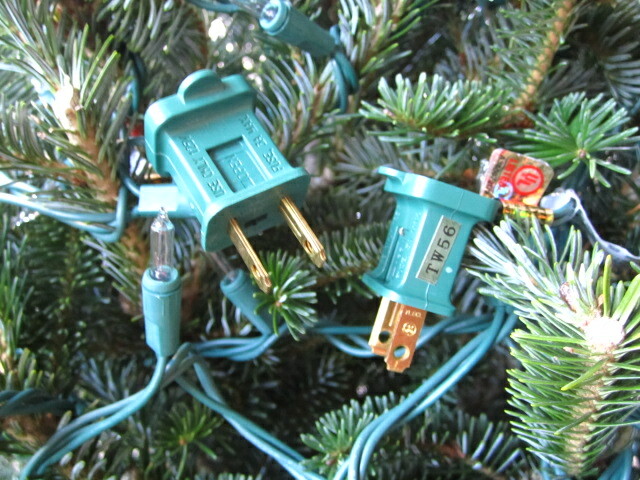 Then I tried plugging them in to see if the tree was passable or completely ugly. 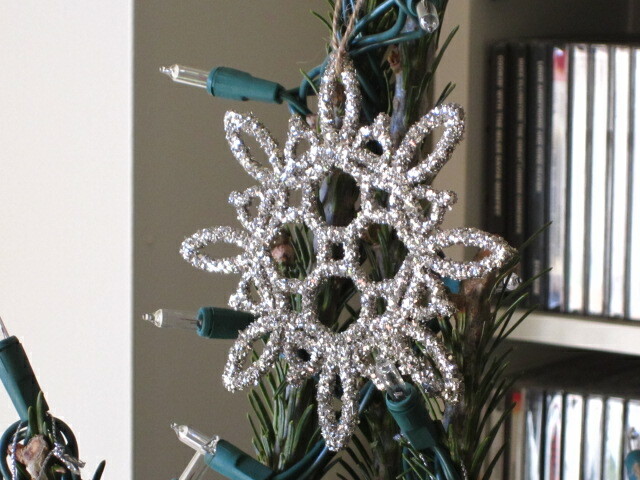 That’s when I discovered that talking on the phone and stringing lights might be one task too many: I’d somehow managed to connect the wrong ends, so that there was no way to actually plug in the dang thing!